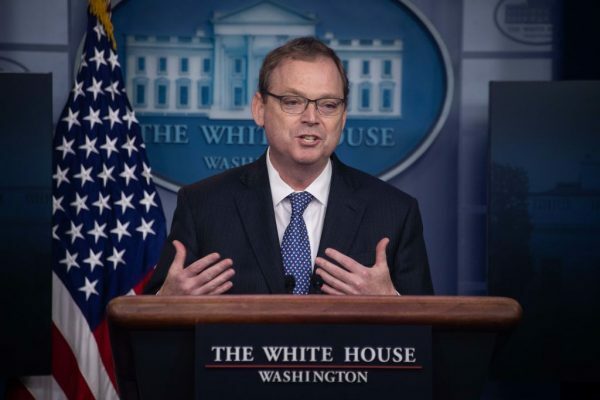 WASHINGTON—Socialists, and their policy proposals that deter growth in the business world, are the greatest threat to the U.S. economy, according to Kevin Hassett, the chairman of President Donald Trump’s Council of Economic Advisers. Hassett’s remarks came in response to growing support for far-left socialist ideas among members of the Democratic Party. 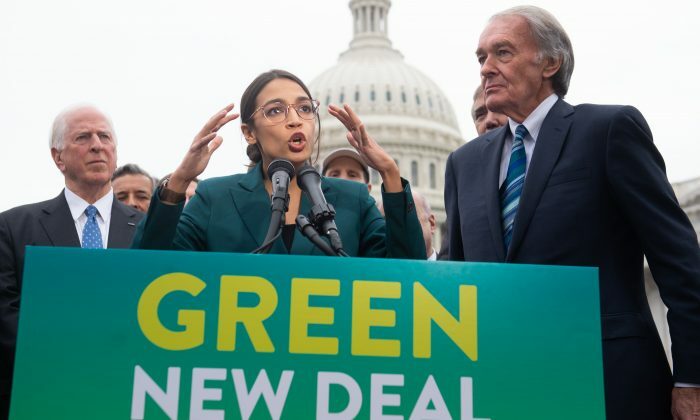 Freshman Rep. Alexandria Ocasio-Cortez (D-N.Y.) drew a lot of criticism recently for suggesting tax rates as high as 70 percent to fund the Green New Deal, an ambitious new environmental agenda. “If you go back to the election, we have seen a massive positive response to this idea that the war on business was over,” Hassett said. Companies started to invest again with the change in economic climate, buoyed by deregulation and tax reform, he added. Manufacturing jobs, which were down more than 300,000 under President Barack Obama, are up about 500,000 under Trump, Hassett said. “Blue-collar wages are growing the fastest we have seen in 20 years,” he said. Replacing U.S. policies with highly socialist policies, such as Venezuela’s, would result in a 40 percent decline in real GDP in the long run and cost about $24,000 per year for the average person, according to a new report by the White House Council of Economic Advisers. In addition, if proposals such as Medicare for All were implemented and funded by higher taxes, the economy would shrink by 9 percent, costing $7,000 per person in 2022, stated the report. Such policy proposals could impact the economy this year because people would start to be pessimistic about the future, Hassett said. Hassett also noted that the administration is closely watching the immediate risk that may arise from slowing growth around the world, especially in Europe and China. “A big chunk of Europe is very close to being in recession,” he said. Southern Europe faces a debt crisis that threatens the bloc’s financial stability, Hassett said. Socialist policy proposals are making significant inroads in the U.S. Congress. In 2013, the Medicare for All plan by Sen. Bernie Sanders (I-Vt.) had no co-sponsors in the Senate. Today, however, more than one-third of Democratic senators have endorsed it. Medicare is a federal program that provides health care coverage to people 65 and older. The bill proposed by Sanders aims to replace the Affordable Care Act with a single-payer health plan. Democrats reject the criticisms, saying the Medicare for All plan would reduce the cost of health care in the United States and provide all Americans free access to medical treatment. The Senate and House Medicare for All plans were sponsored or cosponsored by 141 members of the 115th Congress, according to the CEA report. Many of the Democratic presidential candidates, including Sens. Cory Booker (N.J.), Kirsten Gillibrand (N.Y.), Elizabeth Warren (Mass. ), and Kamala Harris (Calif.), are among the co-sponsors of both Medicare for All and the Green New Deal. The Senate on March 26 failed to advance the Green New Deal, the ambitious plan proposed by Ocasio-Cortez. The final vote was 57–0 against the resolution, while 43 Democrats voted “present” to avoid an up-or-down vote. “No laughing matter, however, is the proposal’s ultimate objective: to give government unprecedented power over people’s lives and our entire economy,” Chamber of Commerce President and CEO Thomas Donohue wrote in an article on Feb. 18. Exposing socialism will be a key focus of Trump’s reelection campaign, according to Kayleigh McEnany, press secretary for the Trump 2020 campaign. She told The Epoch Times that the campaign didn’t plan on tackling socialism, but had to make an adjustment, given that a majority of the contenders embrace the ideology. “So we’re all very keenly focused on socialism—every single one of us in the campaign,” she said. In October 2018, the White House released a 70-page report that denounced socialism and far-left policies. Since taking office in 2017, Trump has criticized socialism and communism on the world stage. In a March 19 press conference held with Brazil’s President Jair Bolsonaro at the White House, Trump blamed socialism for the economic collapse of Venezuela. He said he hoped that the “twilight hour of socialism” had arrived in the Americas.